Lucy Hsu, the exhibition curator as well as a remarkable Taiwanese Artist from the Chinese Planting Artist Development Association shares the idea of sculpting your own textile by using recycle-able items around you. Powertex – a textile curing technology from Europe to apply on the textiles will be introduced by Lucy in a way of re-create a new life for the objects. Planting succulents will be the following last step completing the art work. Make yourself a worth visit to OACC HALL 1, join the workshops conducted by Lucy, to witness and experience the beauty from the combination arts created on an environmental friendly and infinite creativity basis. In such, you… and everyone could be an artist. Human are born with the ability to CREATE. Creation – is able to turn recycle items into presentable art works. The objects are reborn and hence a simple kind circulation of living has simply created. Recyclable object are easily to get which means the idea of becoming an artist is as simple as your inner self has been inspired. Powertex – a “textile hardening” technology, which has minimized the difficulties in textile sculpting. Lucy has incredibly merged this magnificent idea with the world leading technology to encourage more exploration on creativity to be experienced which is practically leading us becoming “An Artist”. She guides her followers and together they present infinite possibilities of one kind material created by different people. The art pieces spark and shine with its own uniqueness implanted with various origin background, conceptual ideas as well as self personality. Eventually she hopes the visitors will be creativity enlightened, become an environmental lover and share with the most people they could so everyone in the world is an artist and we shall live within an artistically environment. exhibits stereography, sculptures, planters, diverse thematic paintings, composite media art and etc that transformed by unwanted junks such as: used costume, polyfoam, alcohol bottle, beverages cup, used paper and etc showing arts is scattered in our surroundings. showcases arts forms are fascinated with individual imaginative thoughts and feeling. People get to know about themselves through art. is unique where people are encouraged to move closer, to observe and to join whatever ways to start sculpting their own art pieces. From there, they will be surprisingly inspired. A BEGINNERS ONE DAY course in succulents planting on a planter that you creatively sculpt. Lucy Hsu – a world remarkable artist whom trend leading the composite art with succulent plants, has been devoting her creativity in the horticultural arts that could prolong the ornamental period of potted plants. She creates plenty of composite art pieces through the various combination in planting the succulent plants. Lucy was selected as the Taiwan Railway Art Village artist due to her art works could simply combining with various environmental friendly materials such as: driftwood, recycled glass, textile sculptures and etc. Integrate technologies of gardening and planting art, develop international market channel, and improve the growth of agriculture and horticulture industries to rise production capacity. Establish talents development and technology research system of science agriculture and horticulture industries in Taiwan by cooperate with industries, government, academia, and related organizations. Promote the division of labor and integration in the upper, middle, and lower reaches to solve common technical problems and improve the development of agricultural and horticultural industries in Taiwan. Promote international technology exchanges, investment cooperation and strategic alliances. Build up technology platforms such as patents, specifications, and verifications, grasp the trends of worldwide science and technology in agriculture and horticulture, and lead the development of technology in Taiwan. Hold related seminars, lectures, exhibitions, study courses, teaching activities, training activities and visits. Promote relevant research, development, discussion and publication. Inter flow and cooperation with related associations, academia, and industries. 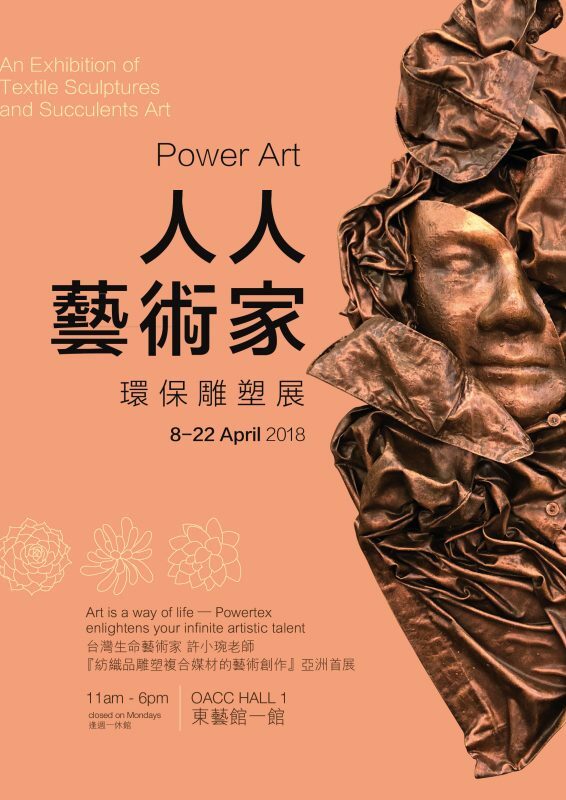 Powertex Asia makes your artistic life come true and unique. PowertexAsia Academy is the branch of Powertex Academy in Belgium. Powertex textile curing technology is popular in 26 countries in Europe and America. It has been released for nearly 20 years and has a wide range of applications.Such as Fiber Art, Mixed Media Art, Air Drying Clay, Doll Making and Sculpture inTheatre, etc. The raw material characteristics of Powertex allow everyone to create their own unique inspiration and imagination beyond their own. You can spent all your time on creation, instead of being plagued by material restrictions and adhesive bonding technology. Powertex textile curing technology enables to combine any kinds of natural materials, such as textiles, paper, cardboard, fabrics, leather, and fiberglass. You can use Powertex to create any kind of artwork, the only limit is your imagination. Powertex fabric hardener and textile hardener is an environmentally friendly water-based liquid sculpting medium. It is the crown on our work to got the highest American Safety label. The USA is very strict regarding the import of foreign products. Especially when the product is suitable for use in the educational sector. The American AP Safety label is worldwide known as the best. Thank you for making the success of this event! This entry was posted in 2018, Exhibition, Uncategorized, Workshop and tagged 2018exhibition, eventinkualalumpur, lucyhsu, oaccevents, powerart, powertex, powertexasia, powertexasiaacedemy, succulentsart, 許小琬的多肉奇慾記.